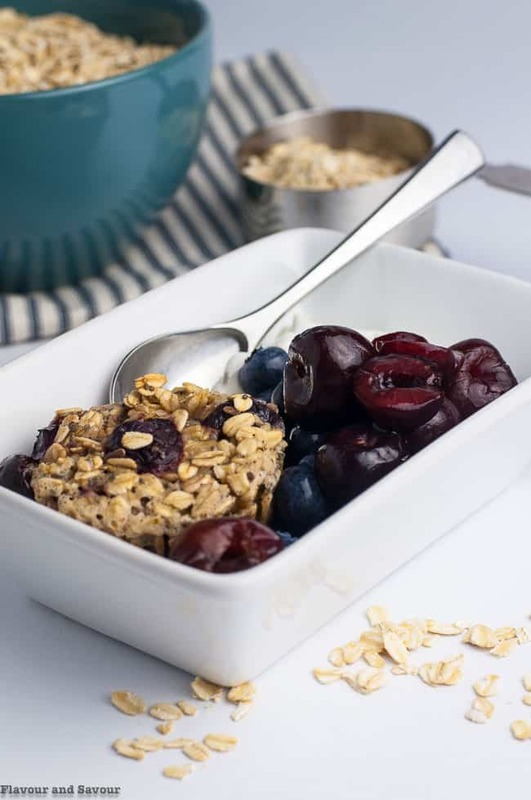 My latest make-ahead breakfast recipe, Cherry Vanilla Baked Oatmeal with Chia and Hemp is packed full of wholesome ingredients. Easy to make it sugar-free, dairy-free and gluten-free! Here’s a simple task for a Sunday evening. 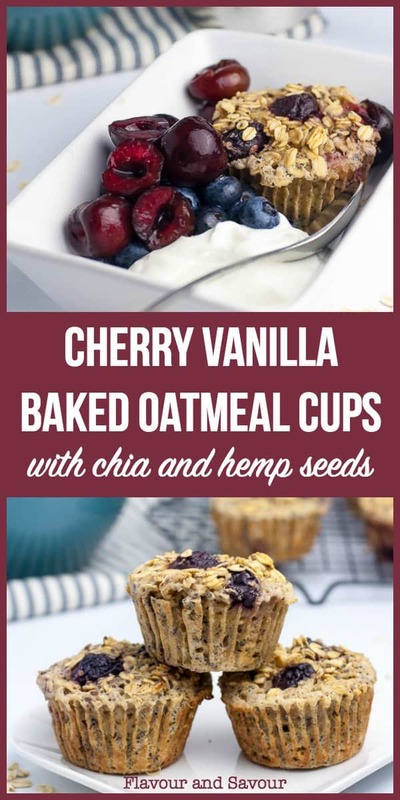 Make a batch of these delicious Cherry Vanilla Baked Oatmeal Cups and have your breakfasts prepared for the week ahead. Serve with fresh fruit and a scoop of yogurt for a totally satisfying morning meal. Make-ahead breakfasts make our mornings so easy. We like to linger over coffee before eating and then have a nutritious breakfast before heading out to the gym or whatever we have planned for the day. 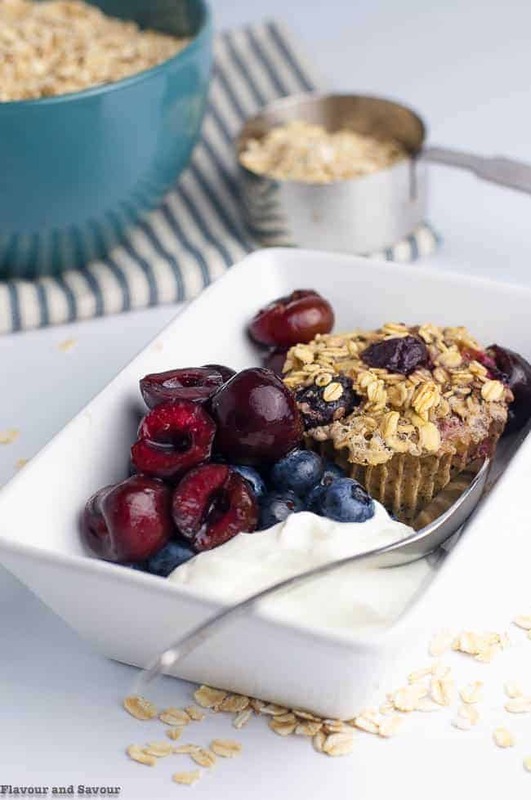 Having these baked oatmeal cups in the fridge or freezer guarantees we won’t leave the house without some wholesome fuel in our bellies. 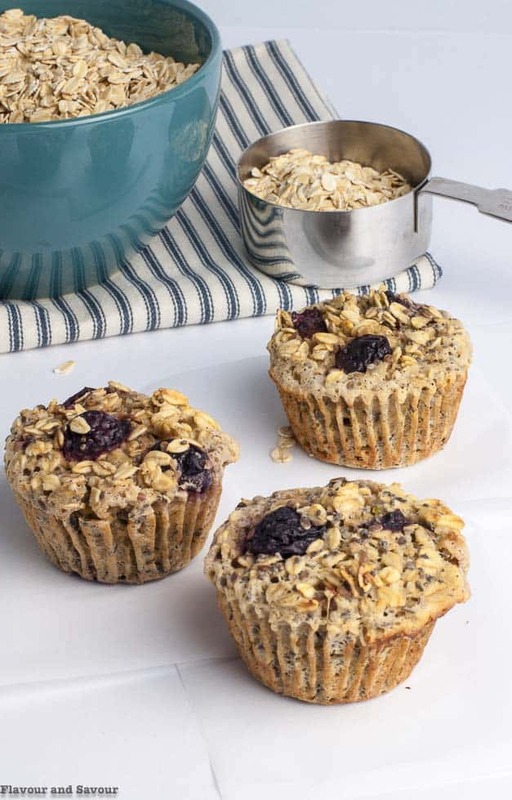 Why should you make Baked Oatmeal Cups? 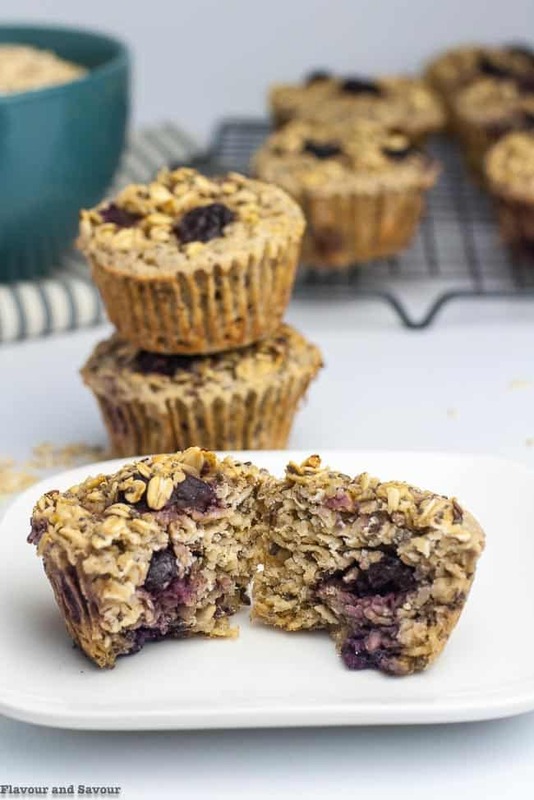 Baked oatmeal muffins are great for portion control. They’re so convenient for a grab-and-go breakfast. It’s easy to adapt a basic recipe with different flavours and add-ins, as I’ve done today. Best of all, they’re as comforting as a bowl of oatmeal without having to stand and stir a pot on the stove. 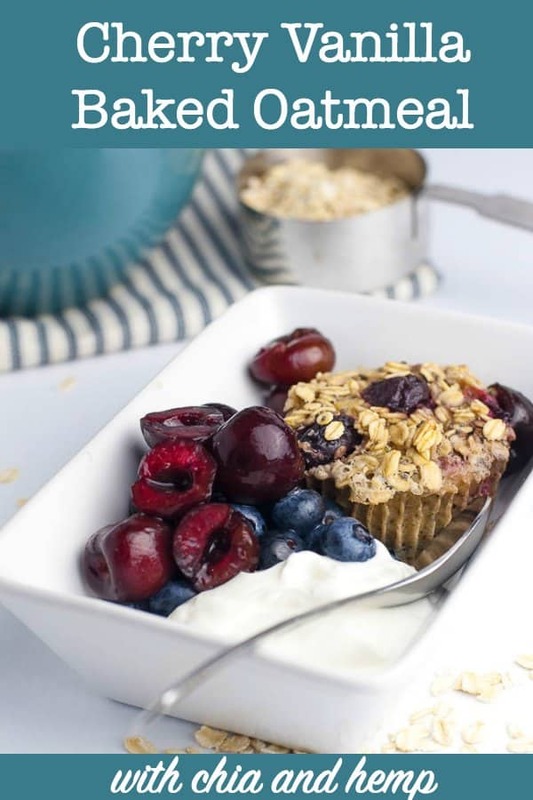 Along with chia seed puddings, overnight oats, granola, breakfast parfaits, and breakfast cookies, these baked oatmeal cups are one of my favourite easy make-ahead breakfast recipes. 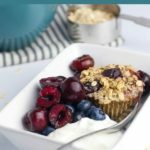 You might also like these Mixed Berry Baked Oatmeal Cups with Chia, Chocolate Espresso Baked Oatmeal or Warm Cranberry-Apple Pumpkin Baked Oatmeal. I’m always reworking my basic recipes to include new flavours based on what is in season, or what I find motivating while grocery shopping. And this week, that was frozen cherries. I know I’m late to the party, but I’ve just discovered frozen cherries. Life-changing! I always pick and freeze my own local fruit and berries. Every summer, we pick raspberries, blueberries, strawberries, blackberries and peaches and freeze them for the winter. We’ve done the same with local cherries in the past, but pitting them is so time-consuming. Frozen cherries sold in bags are already pitted! They’re so easy to add to dessert recipes like this Light Cherry Coconut Yogurt Fool and this Creamy Lemon Cherry Ricotta Parfait. And now, I know they’ll be finding their way into my recipes for muffins, quick breads, and even salads. If you love that cherry-cardamom flavour combo as much as I do, add 1/2 teaspoon of ground cardamom, as the recipe states. If not, stick with a teaspoon of cinnamon. Add 2 teaspoons of pure vanilla extract. It may seem like a lot, but cherries and vanilla bring out the best in each other. Cherries and almonds also complement one another. You could substitute 1/2 teaspoon pure almond extract for the vanilla extract. I made these using Monkfruit with erythritol zero-calorie sweetener, as Denis is following a sugar-free diet, but you can substitute coconut sugar or any granulated sugar. Keep this recipe dairy-free by substituting coconut yogurt for milk kefir or Greek yogurt. Be sure to use gluten-free rolled oats if you are avoiding gluten in your diet. You can also bake this recipe in an 8-inch square pan. Double the baking time. 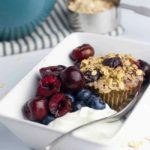 I like to reheat one of these baked oatmeal cups in the microwave, then have it with a dollop of yogurt and a few cherries and blueberries. Denis likes them cold. If they’re not sweet enough for you, add a drizzle of maple syrup or honey. Or warm one up, break it apart and pour a little milk and maple syrup on top. If you make this recipe as muffins, remove the paper liners and cool completely on a wire rack. If you have baked this recipe in an 8-inch square pan, cool, then cut it into squares. Line an airtight container with a piece of paper towel, seal the container and store in the fridge for up to 5 days or in the freezer for up to 3 months. The paper towel will absorb the inevitable moisture that seeps out and threatens to make your muffins soggy. Make your mornings stress-free with an easy make-ahead breakfast recipe! Meal prep your breakfast! 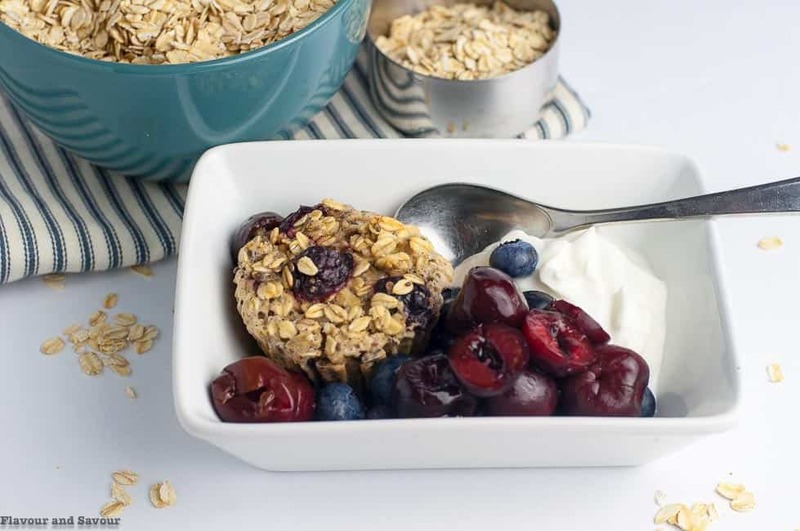 Make these Cherry Vanilla Baked Oatmeal Cups for a healthy grab-and -go breakfast. Great for mid-day snacks, too. An easy make-ahead breakfast recipe. Heat oven to 350°F. Line 12 muffin tins with culinary paper muffin liners or spray with cooking spray. See Note 1. Alternatively, grease an 8-inch square baking dish. In a medium bowl, whisk the eggs, milk, kefir or yogurt, melted coconut oil or butter and vanilla extract. Gently add the cherries, stir to distribute evenly. Fill each muffin cup 3/4 full OR transfer mixture to an 8-inch square baking dish. See Note 2. Optional: Combine 1 tbsp coconut sugar and 2 tsp cinnamon, sprinkle evenly over the top. Bake muffin cups for 20-22 minutes, an 8 x 8 inch pan for 40 - 45 minutes. Serve warm, plain or with milk or yogurt and extra thawed cherries and blueberris. Freeze extra muffin cups in an airtight container lined with paper towel. Reheat in microwave for a quick breakfast. 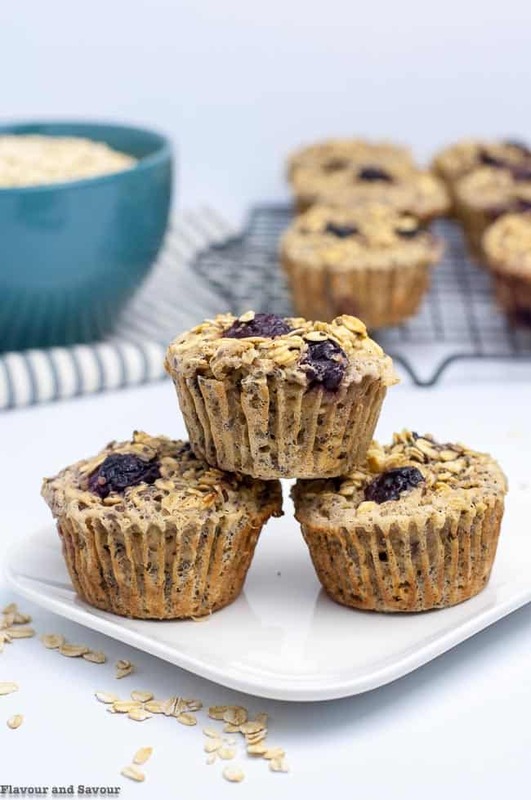 Using culinary paper muffin liners makes these baked oatmeal cups easy to remove from the pan. Using a cooking spray will make the edges more crisp. You choose. I use a large cookie scoop to fill the muffin cups. It makes it easy to distribute the batter evenly. Mess-free! I took your advice and bought some frozen cherries! 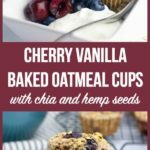 They add lots of natural sweetness to these oatmeal cups. Loved them with a little extra maple syrup on top.